You guys. Never have I ever been so amazed and surprised by something. 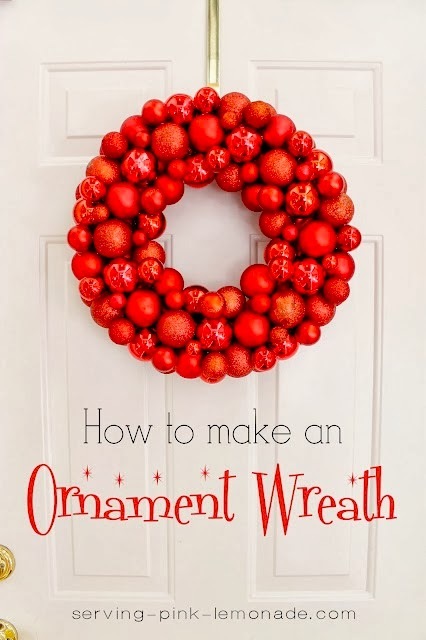 After sharing this year's ornament wreath on the blog, tons of you emailed me photos of wreaths you had created inspired by that post. In just two weeks, I had an inbox bursting at the seams with pictures of ornament wreaths. Imagine my inbox as Chris Farley in a little coat. And don't EVEN act like you don't know and love Tommy Boy. When I sat down to write this post today, I had over 75 ornament wreaths to choose from, all created by you. And every single one was amazing. It was totally impossible to narrow it down, so I made Jesse blindfold me and spin me around and then I threw darts at miniature pictures of the wreaths. 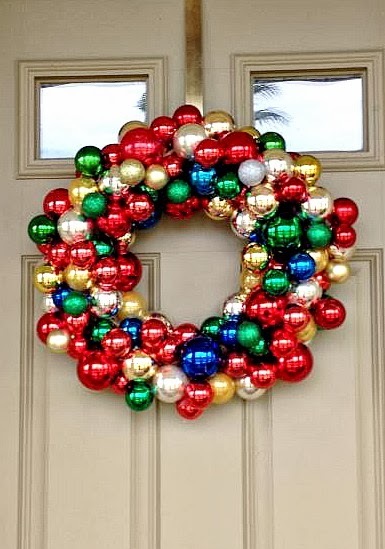 20 lucky wreaths got hit by a dart. We're just going to pretend like that's a real story, okay? Anyways, I'm so honored that so many of you sent me pictures. There are times when I just can't find the right words to tell you what I feel, and this is definitely one of those times. So, while thank you will just have to suffice, please know that it's soooo much more than that. If I could put a free car under your seat, I totally would. Will you settle for a Tonka toy? So, let's get this crazy party started. Here are 20 or so of my favorite reader wreaths. We'll start with Aimee. Because Aimee made five wreaths. I feel like that's justification enough. Here are three of Aimee's creations. 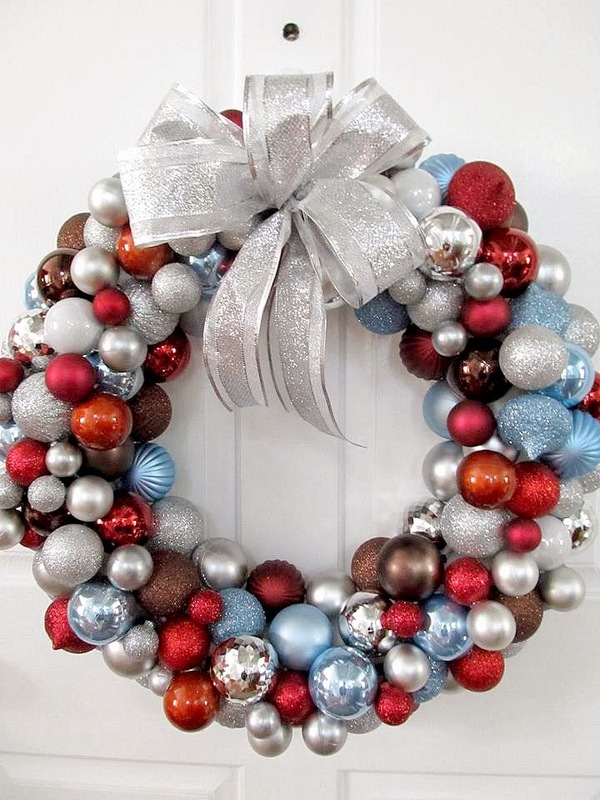 And another one with red, silver, brown, and blue. Aren't those all so cuuute? I love the bows on top, too. Nice job, Aimee! This next one was created by Amy. Amy's stood out to me because it was one of the few I received that was all one color. 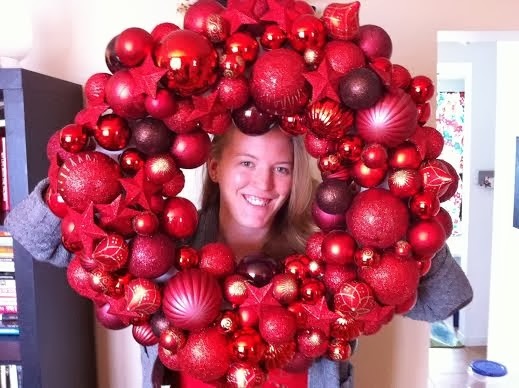 I loved Katelyn's ornament wreath. 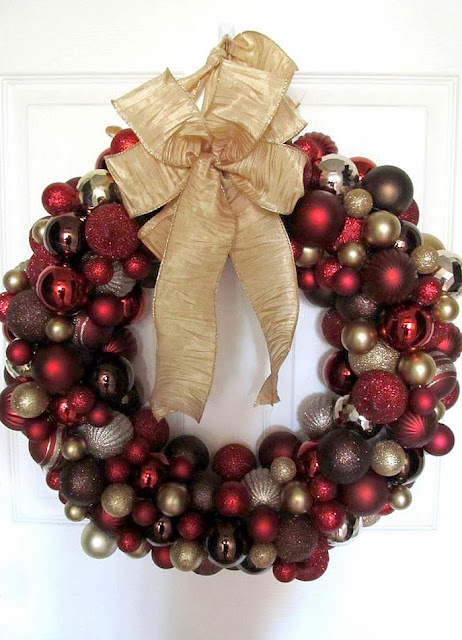 It kinda reminded me of my wreath last year, but even better with that cute red bow. 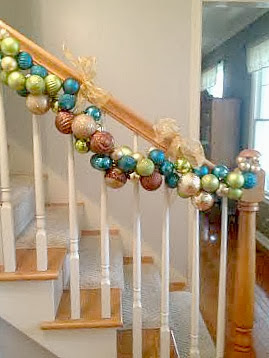 I love the idea of switching things up with a bow on the bottom, too! Ariel made an all-red version, too. Ariel's wreath is awesome, and so is she. Heather is one of my friends from highschool (who has an awesome fitness blog that will inspire you to climb mountains or at least watch her do it), and has been a supporter of my blog since day one. We haven't seen each other in over 10 years, so to say that means a lot would be quite the understatement. Plus, let's be honest. Girlfriend makes a mean wreath. 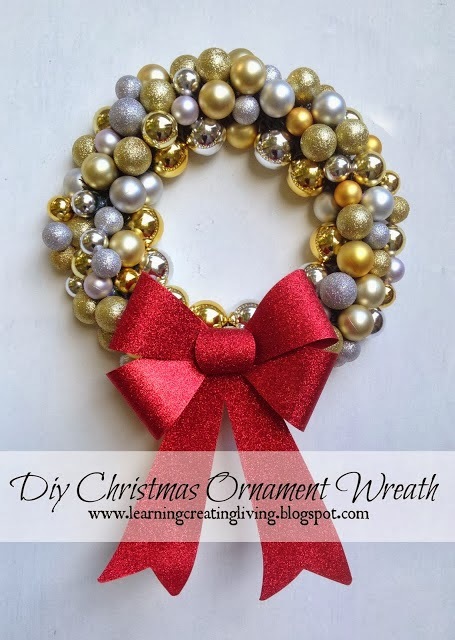 I love Chrissi's ornament wreath. The colors remind me of all the gift wrap from my childhood. Every time I have a bad day, someone should make me wear footie pajamas and pretend like it's Christmas morning, age 6. Actually, redact that. I just want to live in footie pajamas. Ideally, these. Lorri's ornament wreath is absolutely incredible. And what's happening on the mantel below = awesomeness. 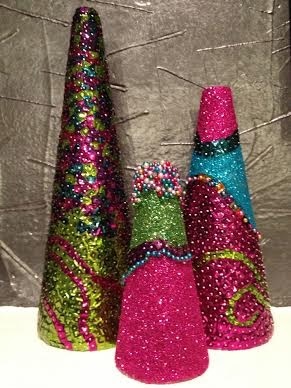 Lorri even made matching trees using sequins and glitter. 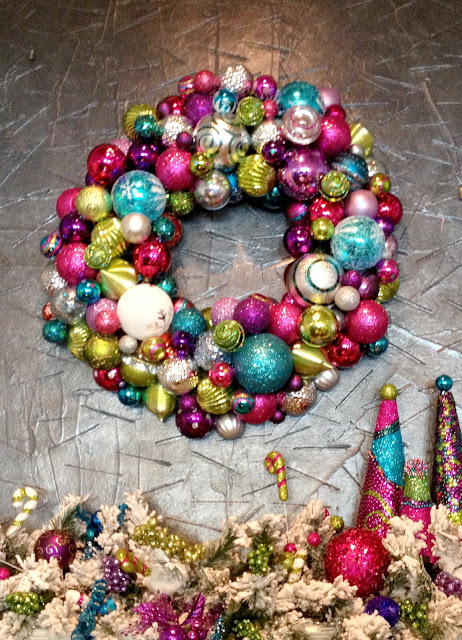 I know, it's not an ornament wreath, but those tiny sequins deserve to be seen. and some ornament garland for her stairs! Tess, you read my mind. 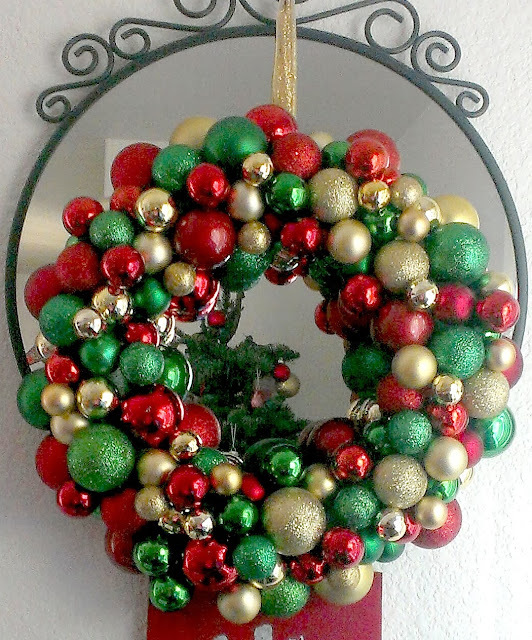 Victoria made a beautiful ornament wreath with the classic colors of green and red and gold. I just love how any color combination looks great! You seriously can't go wrong. 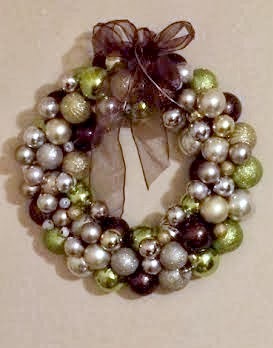 Judy and Rhonda made a beautiful green, brown, and silver version. I loved the email they sent me. They're sisters and they craft together. I need a sister who crafts. If only Mathias would come home from the Navy and hotglue stuff with me. Dangit. Emily made a stunning version using all different sizes and metallic colors. So pretty! I LOVE the blue, green, gold, and silver version created by Blusherine. She even hung it on a mirror, which ya'll know I love. 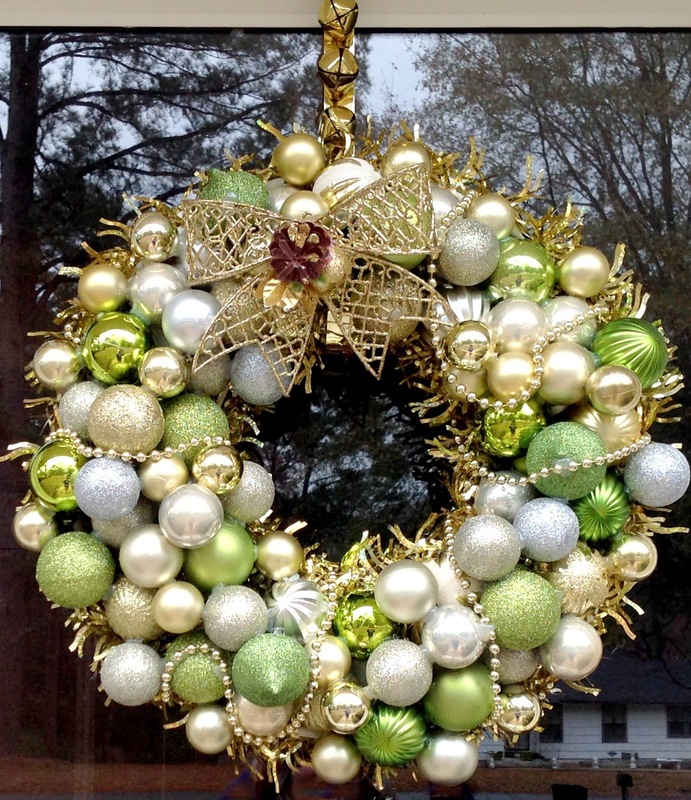 Linda created a gorgeous glittery version using gold, silver, and white ornaments. 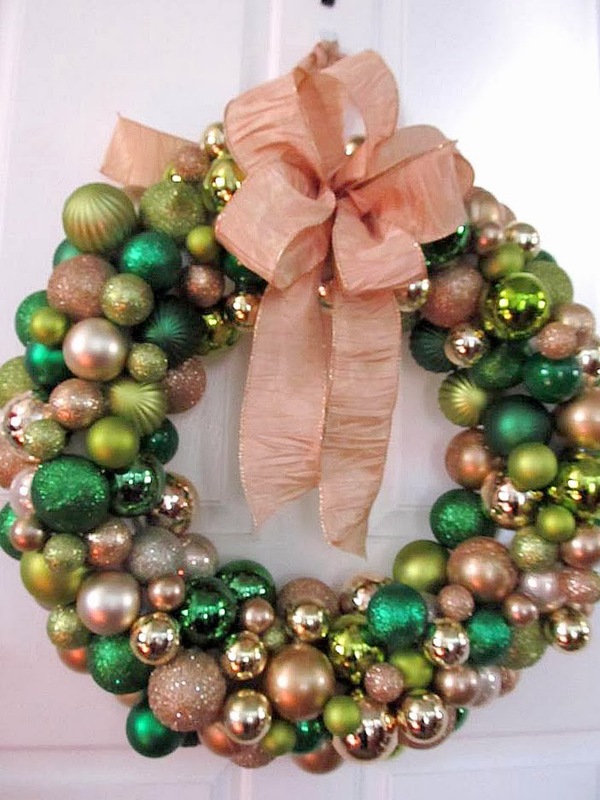 And Linda also created this next one, combining pink, green, gold, and silver! Oh, how it speaks to me. Autumn's wreath really stood out to me, too. 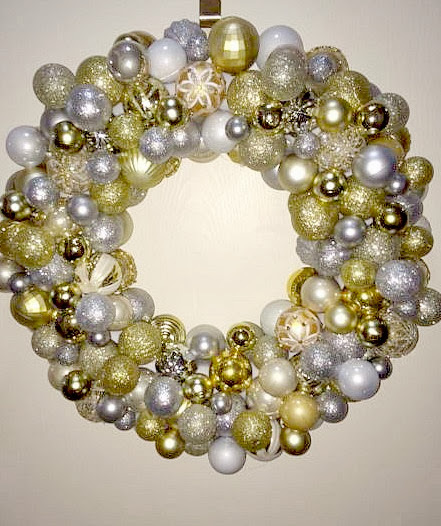 It's so unique, with strands of gold beads, a pretty bow, and a jingle bell wreath hanger. I love it. It's kinda like my wreath this year, but with jazz hands. And last, but definitely not least is the photo I received from Rachel. In a nutshell, these are 6 great friends and their ornament-wreath-making-party. That was one of my favorite emails every received. Thanks, girls! Ya'll are awesome and ridiculously cute. 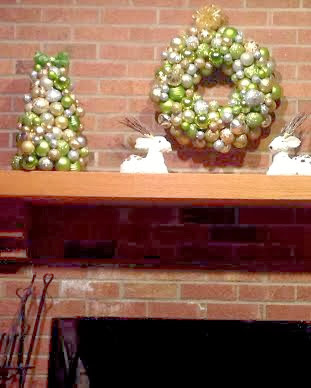 And those are my favorite ornament wreaths from this year! 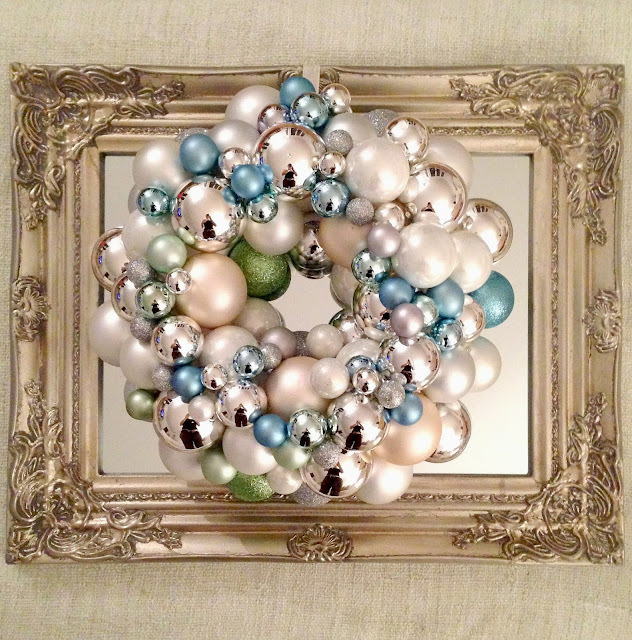 To see my own ornament wreath creations, go here and here. Thank you so much to every single person who sent me a picture of their wreath. 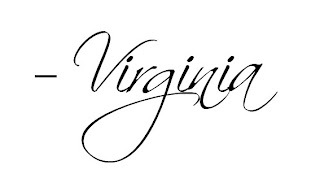 It means so much that ya'll read my blog. Loved your DIY wreath idea! 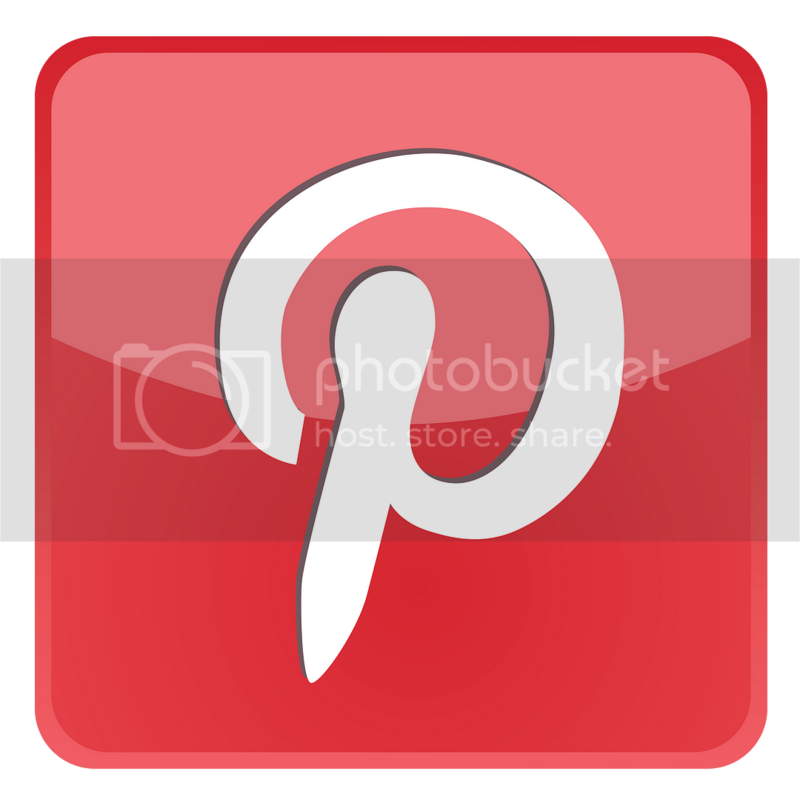 I've made two since discovering your blog! You're awesome! 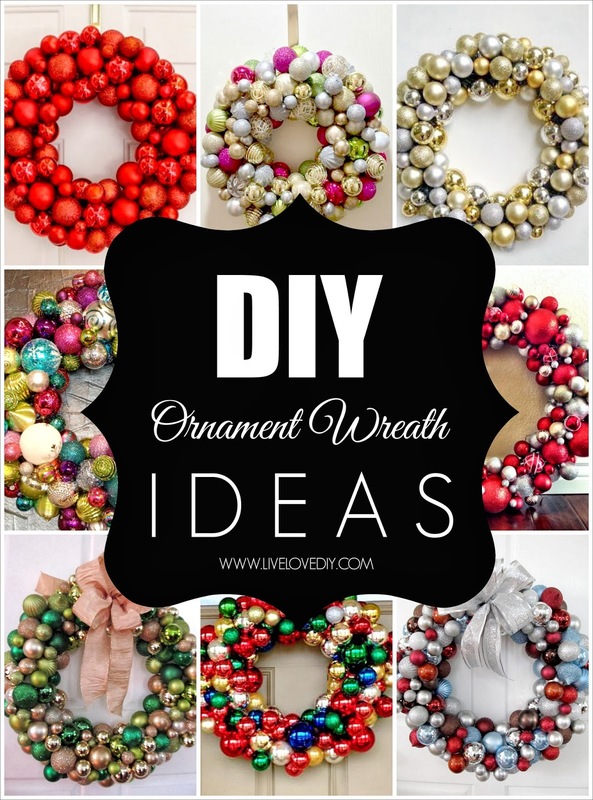 So many great wreaths here, I am definitely inspired to do more now! Thanks for including me! These are all awesome! I love this idea. What a great collection of wreaths! Thanks so much for featuring mine. That is so cool that you had so many to choose from and they are all pretty! These are beautiful! 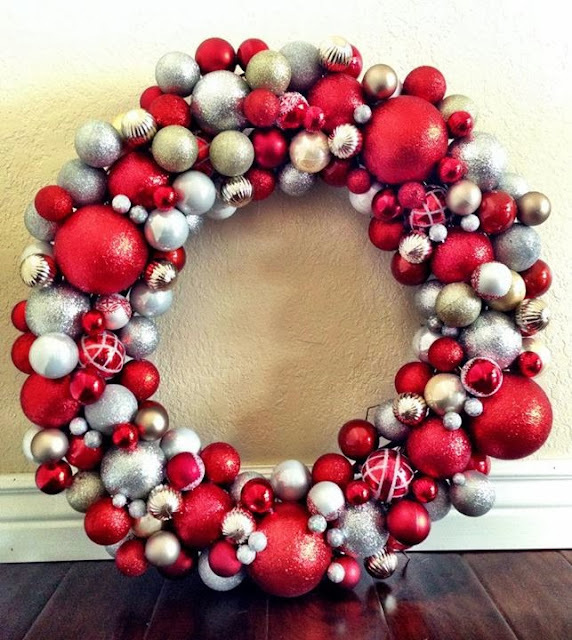 Definitely making one next year, I have already made a snowflake wreath! fat guy in a little coat... your email cracked me up! I do love Chris Farley! Wow. That's a ton of awesomness! This was such a great idea! 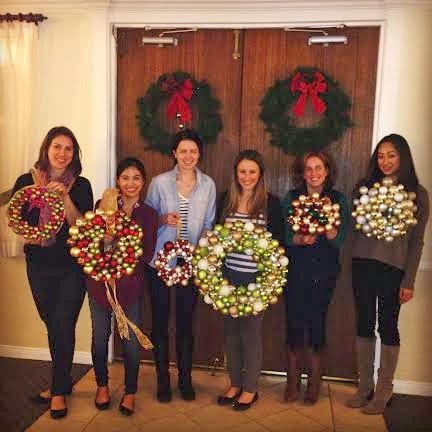 My girlfriends and I got together to do this as well- there were probably about 8 of us that made an ornament wreath, while the others worked on a different craft. It was like a glitter explosion in my house! 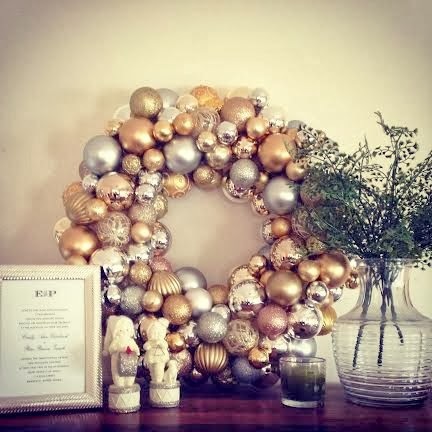 Love all these wreaths! 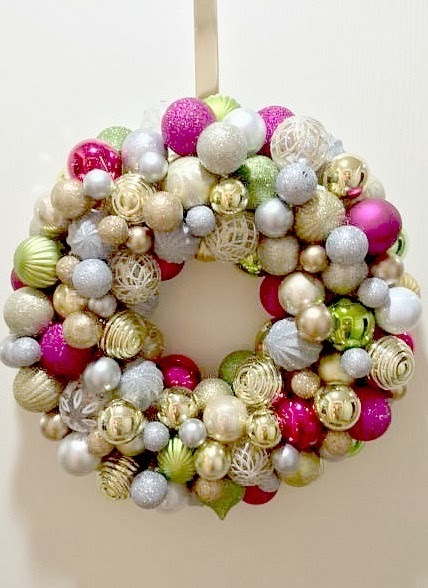 Especially love the idea of a wreath making session with friends. Any tips on how this works best? Is it a bring your own ornaments and supplies? Or does the hostess plan that all out and buy ahead?